What a start to the year Asobi Seksu are having! Not content with releasing the incredible ‘Hush’ album and undertaking a mammoth tour, they slip in a low key release to boot, talk about keen. ‘Acoustic At Olympic Studios’ isn’t technically a full release, it’s only available at the bands shows and the One Little Indian website so truthfully this is a release specifically for the initiated. I’d heard about this a while before I received it and have to say that I was sceptical on the whole. Asobi Seksu acoustic? How would that work? Considering the first two albums are chocker full of multi-layered guitars and the newly released ‘Hush’ is awash with big sounds and sugar coated production it wouldn’t work, would it? The answer is yes and no, the band sound great but you are left wondering whether some of these tracks really suit the acoustic mould. It takes a while to acclimatise yourself to the contrast in sound, tracks like ‘Familiar Light’ and ‘Walk On The Moon’ that usually soar into the echelons are now condensed and fragile, exhibiting a different side to their persona. ‘Gliss’ and ‘Blind Little Rain’ work well as acoustic numbers, Yuki’s haunting vocals are perfectly suited to the minimal arrangements. The acoustic element allows the music room to breath and the listener to explore aspects perhaps unavailable previously. My only issue is with the BIG songs that somehow seem incomplete without the wall of sound accompaniment, they feel like they are built to reach that crescendo so when they don’t it’s slightly frustrating. For the unfamiliar ‘Acoustic At Olympic Studios’ will not endear you to the band and would obviously be a bad place to start. For fans of ‘Hush’ this serves as ideal accompaniment that should be sought out and persevered with. the Brunettes: More guilty of wanton clique infiltration than Ronald Miller, the geek-turned-chic from the campy ‘80s masterstroke Can’t Buy Me Love. With enough Spector pop instrumentation and lyrical bullcrap (“I wanna be Jimmy Dean / ‘Cause he was bad / A human ashtray in a Jag”) to dry out and fertilize the Tucson lawns our hero Ronald power-mowed, the Brunettes weren’t content with merely crashing the E6 / Ann Arbor-Detroit indie party—they wanted to filch the scene’s socialites and host next weekend’s gala at their place. But here’s the rub: It worked. Partly because the Auckland, New Zealand duo are quite adroit at emulating the sonic approach of said peers, bands like Apples in Stereo and Saturday Looks Good to Me. And partly because the Brunettes are self-aware of their fetish for U.S. pop culture (“It’s no secret that when I sing,” chief songwriter Jonathan Bree confesses in “The Moon in June Stuff, “I like to sound American”). In “Summer Love,” Heather Mansfield croons, “And when it hits December / I want a love to remember,” leaving one to scratch their head over an apparent seasonal mix-up before realizing, well, they are from New Zealand. The husband / wife team of Bree and Mansfield finally penetrated indie’s inner sanctum in 2005, nabbing tour dates with the Shins and inking a deal with U.S. independent giant Sub Pop. A recording stint at the most faddish of indie haunts then followed (Portland, Oregon), resulting in the twosome’s third LP, Structure & Cosmetics. Desperate quests for upper crust acceptance are only absolved by what the individual finally does with their newfound rank. If you’re Ronald Miller, you lob shitbombs at best bud Kenneth Wurman’s house. If you’re the Brunettes, you deem the classic, three-minute, get-in / state-your-peace / get-out pop gem—a staple on your two previous releases—too confining (seven of nine tracks check in at four minutes plus), trading in your lo-fi leanings for woah!-fi puffery. I’m still trying to decide which is the more egregious of the two. The overwrought, choir-like vocals on “Brunettes Against Bubblegum Youth” is nothing more than Polyphonic Spree apery. The approach is repeated at the onset of “Stereo (Mono Mono)” before withdrawing quickly, allowing for other recording mishaps to take the fore: Mansfield and Bree’s cringey, we-just-discovered-stereophonic-sound! exchanges and a rather drawn-out, sodden coda. Bree’s compositions are always heavy with texture, but the high points on Structure & Cosmetics emerge when the song’s thick fabric doesn’t fully swaddle its brio: “Small Town Crew,” the guitar picking and Mansfield’s poignant vocals calling to mind vast swaths of the Sarah Records catalogue, and “Obligatory Road Song,” where the layers of multi-tracking never sap the track’s roseate energy. Structure & Cosmetics is the sound of an act attaining in-crowd status, and then quickly illustrating both sonic and lyrical maturity to justify the open-arms acceptance. We don’t expect the Brunettes to be retreating to Ronald Miller-like obscurity any time soon, but a slight return would be welcome. Disons-le d'emblée : ce nouvel album de Miss Jones, son quatrième, constitue son meilleur disque jusqu'ici. Pourquoi? Parce que les 13 pièces du cd (il y en a six supplémentaires, enregistrées devant public, sur l'édition de luxe) dévoilent une chanteuse de 30 ans qui en a marre d'être étiquetée comme une artiste lounge ou jazz. Oh, bien sûr, comme on s'y attendait, l'ambiance générale de The Fall en est une feutrée et douce, mais on retrouve parfois des moments nettement plus rythmés et surtout une impression de prise de maturité de la part d'une auteure-compositrice-interprète qui veut désormais faire partie des grands sans singer (même involontairement) les grands. 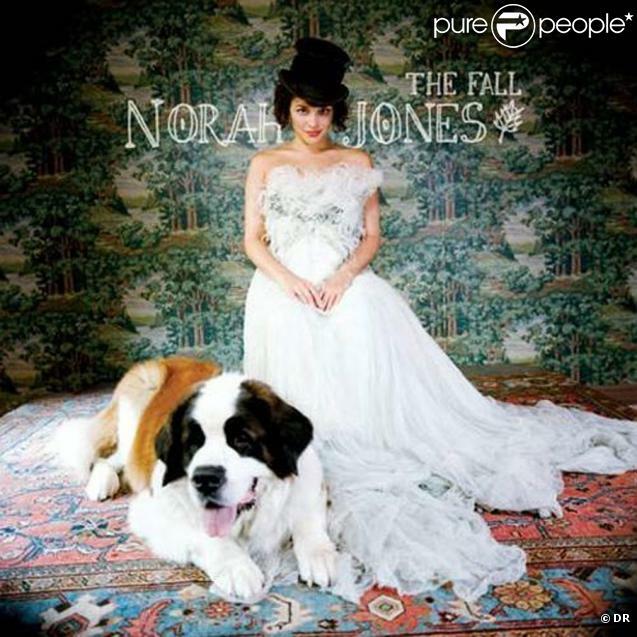 Bref, avec The Fall, Norah Jones, très inspirée, nous laisse savoir qu'elle a expressément pondu le genre d'album qui consacre une carrière, déjà joliment établie dans son cas. L'opus commence avec l'excellente Chasing Pirates et se termine avec une compo pleine d'esprit, Man Of The Hour. Entre les deux, la voix chaude de Norah se charge de rehausser les mélodies efficaces sans être envoûtantes, et l'artiste s'assure ainsi de gagner une fois de plus à sa cause ses fans, qui seront charmés à coup sûr. Dans le cercle des critiques de musique dite «pop adulte», The Fall sera indéniablement considéré comme un des fleurons de 2009. "Tom Waits's babysitter" seems a fairly arresting way to describe a new singer-songwriter. In Californian Jesca Hoop's case, it's bizarrely true. Thankfully, that's not the most interesting thing about her. Hunting My Dress is a nine-song collection of beautiful, pastoral compositions that sounds as if it could be the soundtrack for an autumnal Scandinavian vampire movie. Natural elements rear their head throughout – in the lyrics and literally, as in the case of The Kingdom, which features twittering birdsong. It's good enough to compare to the more wholesome elements of The White Album, Joanna Newsom's Ys and Elbow's quieter moments (Guy Garvey actually lends subtle backing vocals to the gingerbread-sweet Murder of Birds). Enchanting in parts, Hunting My Dress sounds like the sprouting of a wondrous new talent. The Mummers present a strong case for the influence of Tim Burton on pop music. It's not so much that they sound like the soundtracks composed for Burton's films by Danny Elfman - though one hears traces - more that they sound as if they have tried to bring to music the same sensibility that Burton brings to film. Like Edward Scissorhands, Tale to Tell mixes and matches periods - Wonderland skips from a drunken waltz to flighty lounge pop. Like Sleepy Hollow, it is gothic without ever being goth. As with Burton, there's a feeling that assembling the signifiers of sensuality will be enough to bring that sensuality. It's opulent stuff, and from opener March of the Dawn onwards, this music, all strings and brass and careful detail, feels like being locked in a dark parlour draped with thick velvet, incense turning the air heady.